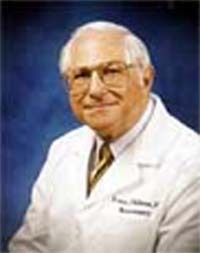 Dr. Avner Irwin Feldman, a top neurosurgeon for over forty years at Daniel Freeman and Centinela hospitals passed away peacefully at home early Tuesday morning July 10, 2007. Avner was a true renaissance man, exquisitely literate with a prodigious memory for Shakespeare and other poets as well as possessing quintessential medical skills that he applied as an accomplished neurosurgeon. Dr. Feldman was born on March 9, 1927 to Lillian and Joseph Ochs Feldman in Brooklyn, New York. As a child he was a swift runner, but was stopped in his tracks at age 13 by contracting poliomyelitis. The year he spent at the West Haverstraw Medical Facility for his polio affliction sparked a lifelong interest in medicine and helping others. He went on to graduate Stuyvesant High School at age 16 with honors and completed his Bachelor of Science at New York University at age 19. He attended the State University College of Medicine at New York City graduating at age 23. In 1949, he was inducted into Alpha Omega Alpha, the National Medical Honor Society, and was the recipient of the William S. Linder Surgical Prize. In 1951, he became a Diplomat by the National Board of Medical Examiners and was ultimately a Fellow in the American Society of Neurological Surgeons. Dr. Feldman served his country in the US Air Force during the Korean War as a staff neurosurgeon in Wiesbaden, Germany from May 1953 until his honorable discharge as a Captain in May 1955. He was married to Rujean B. Feldman who gave birth to Sheri Gwyn in Germany on Dr. Feldman's 28th birthday. Upon his return to the United States, he completed his residency with his brilliant mentor, Dr. Leo Davidoff, who invited Dr. Feldman to join him in his private practice. Although deeply touched, Dr. Feldman declined because he "did not want to live in the shadow of a great man." He subsequently moved to Los Angeles where his son David was born. In 1960, he received Board Certification form the American Board of Neurological Surgery. For most of his prodigious career, he enjoyed a wonderful partnership with neurosurgeons Dr. Leslie Geiger and Dr. Fred Edelman in Inglewood, California serving both Daniel Freeman and Centinela hospitals. In November 1973, he was introduced to Dr. Helene West, then Principal of Horace Mann Elementary/Middle School in Beverly Hills. They were married in 1975 in Copenhagen, Denmark and lived in Beverly Hills for 32 years. After his wife became a clinical psychologist, Avner received the "Outstanding Contribution to Psychology by a Non Psychologist" [award] from the California Psychological Association for his writings and State Senate testimony on behalf of prescriptive authority for psychologists in 1998. In January 1994, Avner became an Associate Clinical Professor in Neurosurgery and Director of Clinical Education at the David Geffen School of Medicine at UCLA. In 2003, he was awarded the "Gold Medal Teacher of the Year" in Neurosurgery. He was called a true gem and an excellent resource for the residents. . . ". In 2007, Avner was presented with the 'Career Teaching Award' by the Residents, Faculty, and Staff of the Department of Neurosurgery, David Geffen School of Medicine at UCLA for his tireless dedication, generosity, and outstanding contributions to the education of residents. He is survived by his wife of 32 years, Dr. Helene West Feldman, his daughter, Dr. Sheri Feldman Ungar, his son David B. Feldman, esq., his son-in-law Ken Ungar and his twin granddaughters, Jamie and Lea. Private family services were held July 2007. Donations may be made to the UCLA Foundation, Neurosurgery Education Fund #616210. Please indicate "In tribute to Avner Feldman, M.D." c/o UCLA Medical Sciences Development, 10925 LeConte Avenue, Suite 3132, Los Angeles, CA 90095, Attn: Adrienne Walt.